P.S- We saw Harvard and thought of you, Don, and Geo. Crawford - remember here at our wedding He was from C.R. and later went to Harvard Med. School was president of Med. Class such a swell fellow. Just [illegible] in No. Africa. He said he knew he'd never get home again and he'd never see his baby boy. 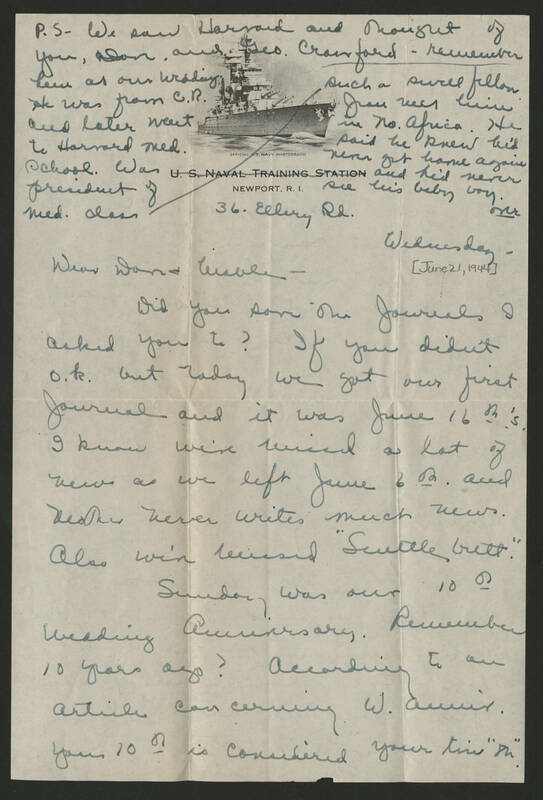 Wednesday [June 21, 1944] Dear Dave + Mable- Did you send [illegible] Journals I asked you to? If you didn't o.k. but today we got our first Journal and it was June 16th's. I know we've missed a lot of news as we left June 6th and [illegible] writes much news. Also win [illegible] "Scuttlebutt". Sunday was our 10th wedding anniversary. Remember 10 years ago? According to an article concerning w. anniv. your 10th is considered your [illegible] "8th".